For years now, Syria’s White Helmets have been working to rescue civilians in the path of deadly battles. So, what they do, as civilians, is wait to see where they are needed and then rush in to help save lives by getting them out of the battle area. Sometimes using their bare hands, they do whatever is necessary. Here’s a short video in which you can see what they do. Interestingly, there are those who say the White Helmets have worked for ISIS. Whatever their past, it is clear that their time in Syria was coming to an end as the Syrian government increased its efforts to stop the efforts of the White Helmets. Today, Israel announced that it has completed the task requested by the US, Europeans and the UN. What they did was launch an operation to bring the White Helmets into Israel through its northern border with Syria and then transport them a bit south and back out of Israel into Jordan. Apparently, the rescue mission was launched in cooperation with Jordan, which agreed to receive the White Helmets and their families. For now, the rescued members and their families will be protected in Jordan for three months and then moved to other countries, which have already agreed to receive them. 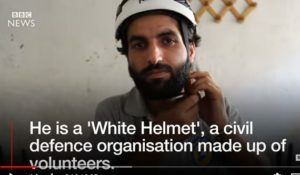 For once, CNN actually has an almost pro-Israel report, explaining what Israel did for the White Helmets. Will the world thank Israel for the efforts it made to save these people? Probably not. Does this represent a change in CNN coverage of Israel? Almost assuredly not. So why did Israel do it? The simplest reason is that the essence of what Israel is requires us not to stand in silence when a wrong is being committed. And so, we did. Really, that simple.